The first phase of downtown San Diego's bikeway was striped in late December with great fanfare. New two-way cycletracks along J Street are just the start, though finishing all three planned phases of the project will take sustained effort. 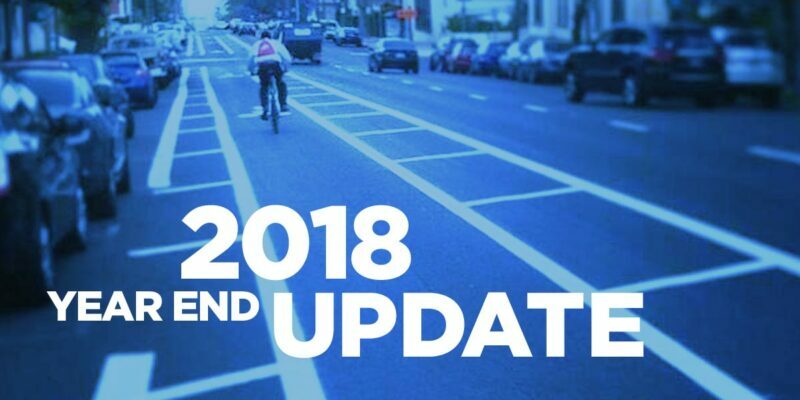 Get the full scoop on progress to date on this central set of bikeways. Una oportunidad de último minuto surgió durante un reemplazo de alcantarillado por UCSD a lo largo de Gilman Drive en La Jolla: se podrían agregar carriles para bicicletas con espacio amortiguado después de que la Universidad volviera a pavimentar el camino. 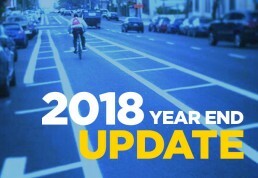 Read about BikeSD's successful presentation to the UC Planning Group and where this led on the safety of the Gilman Dr corridor. A grassroots campaign called 'Right Side Club,' founded by Matt Stucky, pushed for a better north-south bike facility on the eastern side of Balboa Park. The city's current bike Master Plan on the east side were lackluster so Matt laid out a better plan for a bike facility along 30th Street. Check out some great thinking on this potential alignment. A recent push by City Councilmember Chris Ward's office to create a park-like urban space in Uptown, called "The Normal Street Promenade," has pushed back SANDAG's timeline for the Eastern Hillcrest Bikeways by 3 to 6 months. But the Promenade has led to some interesting changes in the bikeway design along Normal Street. Perhaps more importantly, the Promenade has created community-wide alliance to that's invested in seeing SANDAG's Phase 2 bikeways completed in full. El Plan Específico del Área de la Avenida Balboa ha sido una gran decepción para los defensores del tránsito, peatones y ciclistas. Un amplio estacionamiento, diseño de estación centrada en el automóvil, acceso deficiente desde puntos al oeste como Pacific Beach, una rampa de acceso estrecha y difícil para los no conductores. Read about our efforts to get changes in the Balboa Station plan. BikeSD estuvo en la reunión del comité de transporte de SANDAG para abogar por esta importante conexión y para alentar a MTS a trabajar con SANDAG, donde una nueva línea de autobús rápido se cruzará con la infraestructura de la bicicleta. Project information here. (Además, reciba una camiseta gratuita de BikeSD con cada membresía, hasta agotar existencias). We are thrilled to announce that Judi Tentor has accepted the position of Executive Director for Bike San Diego. Judi will be working with John Anderson, interim ED, to transition into the role over the next month. Please feel free to reach out to her at director@bikesd.org and stay tuned for our next member meet-up (details to come) to meet her in person. Judi lives in Mission Hills, grows a lot of food in her garden, and gets around by bicycle as much as possible. She has been navigating the streets of San Diego by bicycle and transit since 2008 when she sold her Honda Element. Her passion for the environment and sustainability drives her everyday actions. Riding a bicycle, she believes, is more than a fun activity, but also a tool for transportation as well as a solution to environmental, social equity and health issues that matter to her. Judi también es instructora de ciclismo (LCI # 5098) certificada por la Liga de ciclistas estadounidenses, la organización de defensa de bicicletas más antigua de los Estados Unidos. Enseña clases para principiantes para adultos que aprenden a conducir por primera vez y clases de habilidades de tráfico para corredores intermedios a través de organizaciones sin fines de lucro. Es una defensora del transporte activo y una feminista, con la esperanza de inspirar a más mujeres a andar en bicicleta en beneficio de su salud, su espíritu y el planeta. As a bicyclist, advocate and cycling instructor, she has been leading efforts to get more bicycle infrastructure in San Diego. She currently serves on the board of the Mission Hills Town Council. When not pedaling and sometimes while pedaling, Judi takes photographs of people riding bicycle and bicycle infrastructure around the world. 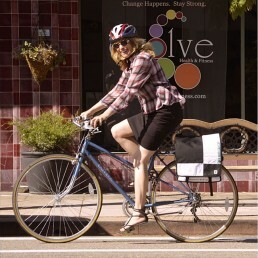 She holds a bachelor’s degree in Environmental Science from SUNY ESF and a Masters of Landscape Architecture from The Ohio State University, and was awarded a Comprehensive Bikeway Design Certificate from Portland State University. A great BikeSD supporter recently donated an XtraCycle Free Radical bicycle extension / conversion kit to BikeSD and thanks to some additional donations of a bicycle, labor, and parts from MJ's Cyclery we now have an awesome cargo bike for members to use! Big thanks to the donor and MJ's for making this happen! To explain a bit more, the XtraCycle Free Radical is an attachment that takes an ordinary bicycle and extends the frame, adding capacity for carrying more people, groceries, tools, beach toys, etc. Please see below photos to get an idea of what the bicycle looks like and what you might use it for. The bicycle frame used is a GT Outpost Trail mountain bike with 27 gear options (3 in front, 7 in back) and is a really nice choice if you are putting a lot of weight on the back since mountain bikes have nice low gears to help getting up steep inclines. We're still trying to figure out what we'll be using the bike for but first and foremost we want to offer it for use free of charge to any BikeSD members. If you're thinking about buying an XtraCycle or a cargo bicycle and would like to test one out first, please borrow ours and give it a spin for the weekend. Want to try out taking your kids to school by bicycle? You can borrow the bike and take them out for espresso then drop them at the school gates in style. Grandma coming to visit and you don't have a spare bike? Borrow this one and you can ride together all over town. If you'd like to borrow this great bicycle and give it a spin please drop us as email at talk@bikesd.org with the date(s) and time you'd like to use it and the location that's best for you. We'll do our best to accommodate and look forward to seeing this great bike around town. Notes: when using this bicycle please make sure to lock it up at all times (lock provided with bicycle) and use lights when operating. Bikes del Pueblo started setting up at the farmer’s market in City Heights about a year ago, and before that they shared space with the City Heights Free Skool/Escuela Libre de City Heights. The bike kitchen’s mission is to provide a non-threatening environment for people to come and learn to diagnose and repair problems with their bicycles. The tools and the expertise of the volunteers are both completely free. While I was there, a young girl who had just finished repairing a flat tire shyly pushed a one-dollar bill at one of the volunteers before riding away with her family. Donations, when offered, are accepted by the bike kitchen, but there is no suggested donation, or any requirement to donate. As much as Bikes del Pueblo are committed to educating residents about how to fix their bicycles, they are also deeply interested in forming bonds and building trust within the community. On the morning I spent with them, a lot of people from the Vietnamese community were stopping in. Hernan, one of the bike kitchen’s volunteers, explained that last week they had helped a Vietnamese man fix his bicycle, and he thought that word about the kitchen must have spread through that community. Currently, Bikes del Pueblo is staffed by just three volunteers. They are always looking for new volunteers, especially multi-lingual ones, to staff the kitchen and they always appreciate donations of cash, tools, parts, or whole bicycles. For now, they can be found on Saturday mornings at the City Height’s Farmer’s Market, but they are hoping eventually to establish a permanent location somewhere in the Mid-City area. Here's some contact info from Bikes del Pueblo.